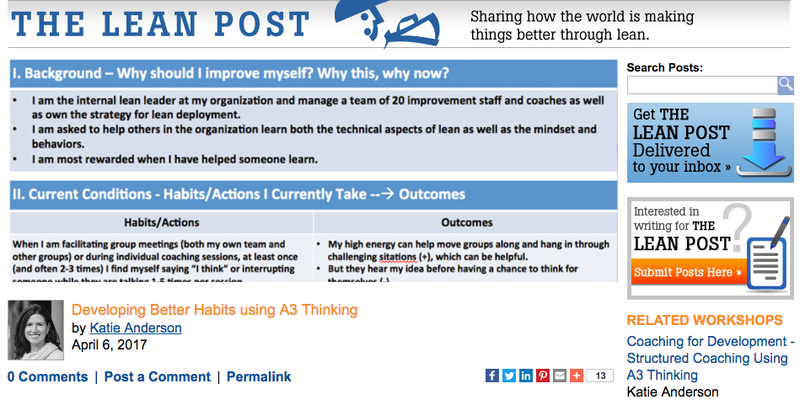 My latest article for the Lean Enterprise Institute’s Lean Post, “Developing Better Habits Through A3 Thinking”, was published today – check it out and let me know what you think. In the article, I share my own experience with using A3 thinking for personal improvement after the concept was first introduced to me by my coach and mentor Margie Hagene. My efforts to personally develop better and stronger leadership habits were the inspiration for several of my earlier Lean Post articles such as “How to Get Out of the Habit of Telling” and “Be More Than a Coach, Be a Coach Who Listens”. Using personal A3 process has now become a habit into itself that I employ to stay focused on my ongoing improvement. It is also a framework that I use in my coaching relationships. 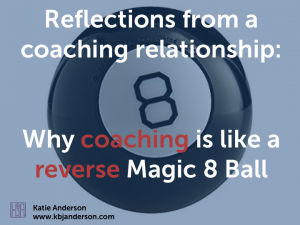 As an example, one of my coaching clients Michelle and I shared how we use the personal improvement A3 as both learner and coach last year at the Lean Coaching Summit. Click here to receive a free copy of the coaching tips for supporting others to develop a personal improvement A3 that we developed for the 2016 Lean Coaching Summit. The A3 flow remains the same, but the focus of the “problem” is inward. How can you use A3 thinking to develop better habits? What YOU or YOUR learner needs to improve on may be different than my development needs. But regardless of the focus of the improvement, the personal A3 process cab be an invaluable one for accelerating personal improvement. What problem are you going to focus for your improvement? How can you incorporate A3 thinking into your coaching practice to help others practice and strengthen their lean leadership habits? Come learn and practice – with a coach! Want to learn more about how you can use the personal improvement A3 process as a coach to help support the development of others? Sign up now to join me in Seattle on April 24th for an engaging day of learning and practice. In this workshop we will discuss some key coaching strategies and behaviors and explore how to coach someone through the different phases of the personal improvement A3. If you can’t make it to Seattle, Margie (my coach and mentor who I reference in today’s Lean Post) and I are co-facilitating a two-day “Coaching for Improvement” workshop May 4-5 and June 5-6 in which you will also get exposed to the concept of the personal improvement A3. Sign up to be notified when I publish new posts. Next up – insights and observations from my visit to a lean-thinking local government office in Tokyo.